Thanks for visiting! I play bass (electric and upright) and guitar. I am a new transplant to the lovely town of Murphys, CA, and I play around Murphys and the Bay Area. I do both solo and group projects that explore straight jazz, free-form jazz, blues, soul, jam music and even some electronica. 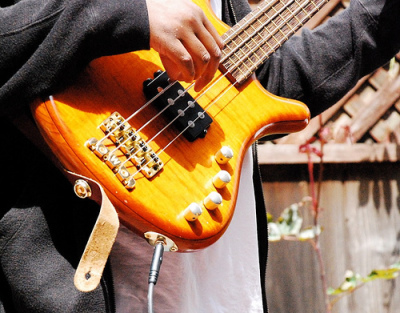 I also teach bass lessons, so please check out my page here! I play music with friends EVERY Thursday night from 6-9pm at the Murphys Irish Pub in beautiful downtown Murphys. This is really a free-form night and we improvise our way through Jazz, blues, rock and everything in between. I also lead The Delaney Project – an ensemble of improvisational players who explore straight jazz, free-form jazz, blues, soul, and jam music. Each ensemble is different and each has its own unique voice. I am fortunate enough to play with Murphys own, Grover Anderson and the Lampoliers. We play a lot, so come check us out! Oh, and I do some Solo shows with live bass and guitar loops layered over electronic loops and samples (fun!). And although we are scattered to the far ends of the nation, occasionally, when the moon and the stars align, I am able to get together with my boys from my funky, jazzy, bluesy trio, ABELsound.Deeply rooted in the East Bay vibe, ABELsound pours its own slow-simmered, improvisational, funky groove over anything from Miles Davis and Herbie Hancock to Pancho Sanchez and the Beatles. Please check out the Music page for listen to some tracks. Please check out the Calendar page to see where I’m playing.